More than two-thirds of the Bay Area’s water is imported from outside the region. Today these supplies are regularly threatened by drought, earthquakes, water quality impairments and new regulations on availability and usage — risks that will intensify with future climate change. Meanwhile, our region of 7 million people will add 2 million more by 2040 — growth that will require more water. Do we have the water we need to support our projected population growth? And what are the most sustainable and reliable ways to supply our future water needs? 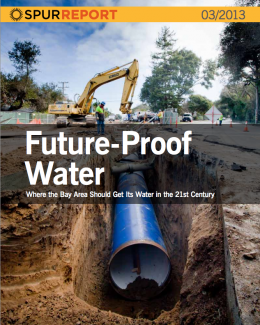 To answer these questions, Future-Proof Water analyzes the Bay Area’s current water supplies and future growth projections, then recommends the best tools for meeting our water needs — both in the near term and through the end of the century. The SPUR Board of Directors reviewed, debated and adopted this report as official policy on January 16, 2013. Future-Proof Water is generously supported by the Richard and Rhoda Goldman Fund and the San Francisco Foundation. Michaela Cassidy, Aspen Affiliates, Inc.
Aaron Lee of AECOM and Adam Weiner for research assistance. Staff members at the San Francisco Public Utilities Commission, Santa Clara Valley Water District, East Bay Municipal Utilities District and Alameda County Water District for their review and comments.